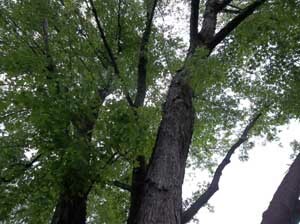 For safety reasons, my sixty year old silver maple tree will be cut down and ground to its roots tomorrow. A large limb dropped off two weeks ago from no additional force – no wind, no lighting. Fortunately, no one got hurt when the limb fell, crushing the fence and taking down the power at 2:00 am. I will miss swinging in the woven rope chair, listening to breeze flow through the branches and the sound of laughing leaves. I will miss the canopy of shade and the beauty it gave freely without condition. For so many sentimental and the practical reasons, the tree will be greatly missed. So, I’m having a tree funeral – food (no casseroles), guests and all. Material things, even trees, can be replaced. Family and friends are to be treasured. So a tree funeral to say goodbye and to honor the gift of majestic nature in my backyard for so many years. I will be there to say goodbye to your tree that has given a lot to you over the years and enjoy the company of family ands friends. I’m sorry you’re losing your tree. It is a sad day when a big, leafy friend passes. We will toast in honor of your friend this evening. I know you will miss this tree. You can read “The Giving Tree” as a eulogy. You can also replant a tree in its place if you dig and grind up the stump. You are very caring. I’d love to meet you. My sympathy, prayers, and condolences to your and your family. Being a Canadian, I feel especially connected to maple trees. I’m not sure if they are the official tree of Canada, but you see then around a lot and they are honoured in our flag. So I am touched that you are having a tree funeral for your majestic, silver maple and celebrating the friends and family in your life – all enjoying the gifts of the maple tree one last time. Thanks for blogging. I enjoy reading it so much. We have silver maples all over our yard, and they are beautiful and majestic–and almost all dying. So sad!!! It’s sad you’re losing the tree, but wonderful that it gave you so many good memories. I love the idea of the tree funeral.